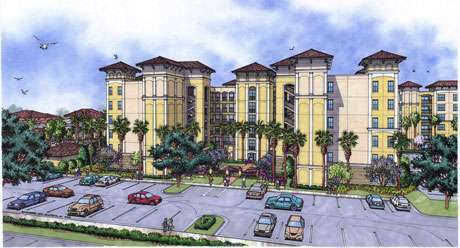 The Floridays resort will compromise 2 and 3 bedroom condominiums in six floor blocks. The condominiums will be tastefully decorated, fully furnished and even have pieces of art. Kitchens will be fully equipped. The lounge will have a large screen TV and games system. Each bedroom will have a TV. Broadband internet access will be available. The high standards will be maintained outside the condominium with hotel-style check-in, concierge service, pools, childrens water play area, fitness centre, restaurant and market place. 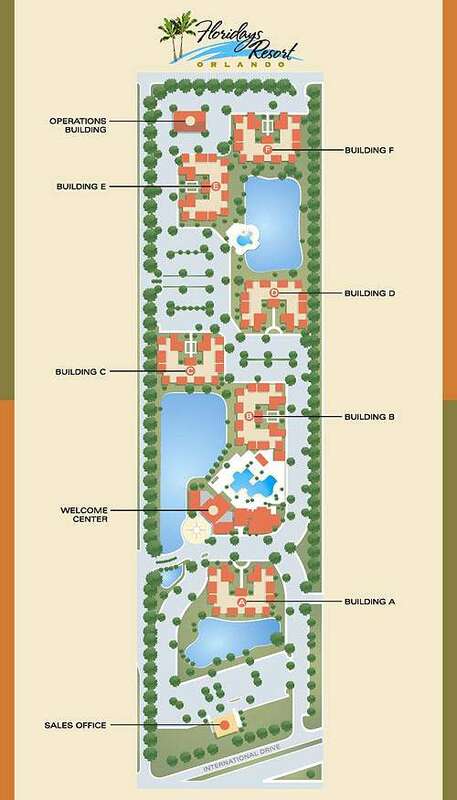 This is a high quality, upmarket resort, in the very heart of Orlando. Buildings B,C,D and E are now sold out. Building F has been released for sale. Construction is underway as of late Feb 2005. 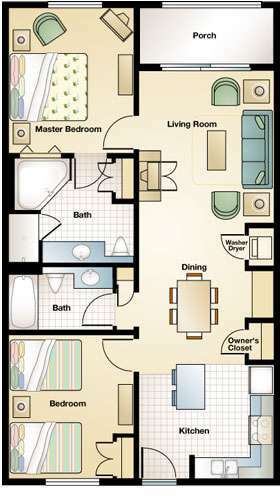 2 BED 2 BATH CONDO 1017 SQ.FT. 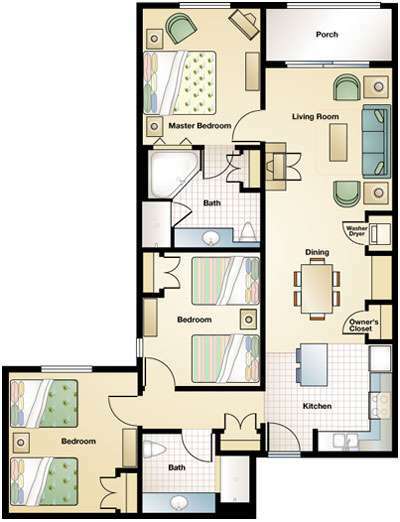 3 BED 2 BATH CONDO 1306 SQ.FT. Price includes decorating, furnishings, fully equipped kitchen and home entertainment system. 70 sq.ft. balcony. Price is minimum and depends on unit chosen. Inside the Floridays Welcome Center, you’ll find a fully equipped fitness center, an electronic game room and a children’s activity center. A restaurant facility offers casual dining and take-out options so you and your guests can enjoy convenient meals inside the restaurant, at poolside outdoor tables, or in the comfort of your unit. The facility also includes a marketplace that offers groceries, toiletries, sundries and other essentials for Floridays residents and guests. A beautifully landscaped grand swimming pool complex adjacent to the Welcome Center features an expansive, open pool with lounge area and an adjacent deck for casual gatherings. A water jet playscape and wading area for small children is located near the pool. A smaller, more private pool, especially suited for lap swimming and sunbathing, is situated at the opposite side of the property from the main swimming pool complex. A beach area near the pool is the perfect place to sunbathe or build sandcastles.